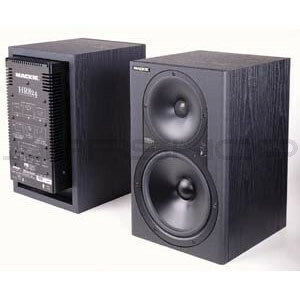 The Mackie HR824 has been meticulously designed to be a completely neutral instrument for the analysis of your creative output. And why you shouldn't compromise your work with anything less. The HR824 in action really is a revelation. The stereo sound field is wide, deep, and incredibly detailed. High frequencies and midrange are clean and articulated. Low frequencies are no more or less than what you recorded -- you can actually hear the distinct tonal qualities (and harmonic quantities) of a particular bass instrument -- instead of just a "generic" bass note. Most important, the sweet spot is a broad, three-dimensional area that gives you room to move up, down and across the console. In short, instead of having its own distinctive "sound," the HR824 sounds like the outputs of your mixer.